Flow cytometry is an invaluable technology used in a wide variety of biological research. However there are many things to remember during a flow experiment. 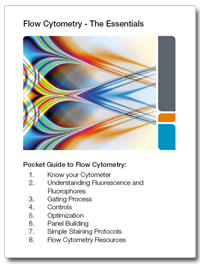 To help with this we have created a handy pocket version of our popular flow cytometry guide which contains a basic overview of all the important features of flow cytometry, from instrument to experiment. Designed as a quick reference guide when you are in the lab it contains checklists and tips to ensure your experiment will be a success.